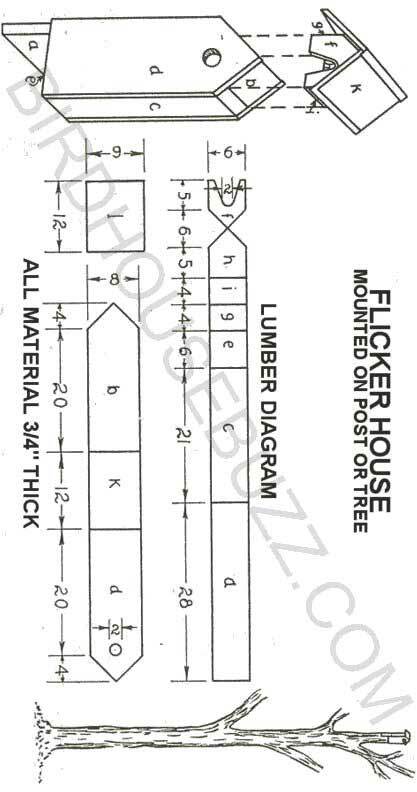 Free plans for building a flicker bird house. Flickers are cavity nesters who typically nest in trees though they will also use posts and birdhouses if sized and situated appropriately. They prefer to excavate their own home though they will reuse and repair damaged or abandoned nests. Abandoned flicker nests create habitat for other cavity nesters. The flickers spend much of their time on the ground in search of ants which form the larger percentage of their food. 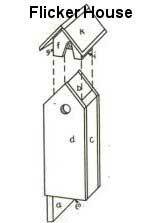 Therefore, they will frequently live in houses nailed to fence posts. Houses are more apt to be occupied if placed in position in fall or winter before the spring migration, especially houses made of freshly dressed or newly painted wood.